The positioning of events. Which day or which part of the time axis an event is on top of. The way in which you should interpret the exposed native Date objects throughout the API, such as an Event Object’s start/end, a View object’s activeStart/activeEnd, or the dates exposed by the dateClick or select callbacks. Read more about Date Objects. When event data is received, the way in which dates are parsed. This only affects dates that were supplied with no time zone information, aka ISO8601 date strings that do not supply a UTC offset. Read more about Date Parsing. Every browser has a default time zone, which is usually determined by the settings of the user’s operating system. This is considered the “local” time zone. It will vary for different users of you calendar, depending on where they live or how they have their computer configured. If your events’ dates were defined relative to UTC, either via a millisecond time or an ISO8601 string with a UTC offset, then your dates will be appropriately shifted to display in the user’s local time zone. If your dates were supplied as ISO8601 strings without UTC offsets, they will be parsed (and thus displayed) as if they were local. When using the dates emitted from the API, you’ll want to access their local values via methods like getMonth(), getHours(), and toString(). Read more about Date Objects. Whereas the local timezone will vary from browser to browser, the UTC time zone is guaranteed to be the same in every browser. It will also not experience daylight savings times. The UTC time zone was designed this way and it serves as a time zone that other time zones define themselves relative to. If your events’ dates are defined as ISO8601 strings with UTC offsets, then your dates will be appropriately shifted to display in the 00:00 offset. If your dates were supplied as ISO8601 strings without time zone offsets, they will be parsed (and thus displayed) as if they were UTC. When using the dates emitted from the API, you’ll want to access their UTC values via methods like getUTCMonth(), getUTCHours(), and toUTCString(). Read more about Date Objects. If you’d like all your events to display consistently across browsers regardless of your users’ local time zones, UTC will achieve that. However, if you are leveraging UTC to simulate some other real time zone, please use “named time zones with UTC-coercion” instead (mentioned below). It is more elegant and made for this purpose. A named time zone is a specific region of the world specified by a string like 'America/New_York' or 'Europe/Moscow'. Just like the UTC time zone, it will display consistently across browsers because there is no ambiguity. However, not all browsers natively support named time zones the same way they do local or UTC. 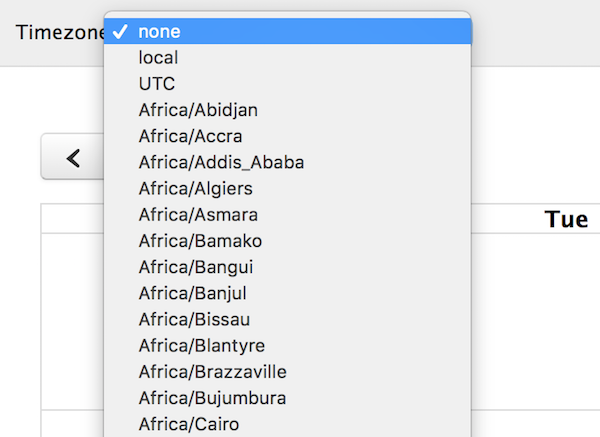 More specifically, the native Date object doesn’t know how to compute their time zone offsets. Thus, if you plan to use named time zones, you’ll need to decide which time zone “implementation” FullCalendar should use, which come in the form of plugins. When no timezone-related plugins are present, the calendar will do “UTC-coercion”, which means all dates will be forced into UTC-based native Date objects, even though those dates technically did not originate in UTC. Though this is a “hack” for working around browser limitations, it works quite well. You’ll need to remember to use each native Date object’s UTC-flavored methods like getUTCDate() and toUTCString(). When parsing ISO8601 strings that have time zone offsets, like 2019-09-01T12:30:00-05:00, the offset (-05:00) will essentially be ignored! If an Event Object accepted the date in this example, its event.start.toISOString() value would be '2019-09-01T12:30:00Z'. Though the offset is ignored for parsing date strings into native Date Objects, the time zone offset will magically be available for event datetime formatting in eventTimeFormat. When using a third-party time zone implementation, You won’t be able to use the local accessors like getMonth(), nor the UTC accessors like getUTCMonth(). You’ll need to leverage the plugin to interpret the Date object.